Be part of the 33rd Annual Morris Brandon Fun Run on Saturday, April 13, 2019 (rain date Saturday, April 20, 2019)! Register HERE before midnight on Sunday, March 24, 2019 for Early Bird pricing of $15 and to guarantee a t-shirt. After March 24 (including race day), late registration will be $20, and t-shirts are NOT guaranteed. So, don’t BEE late! Fun Run t-shirts will be distributed prior to the Fun Run for Early Birds, so students can wear them on Spirit Day the Friday before the race. The run is 1 mile beginning on Dover road travelling through the Castlewood neighborhood and ending on Mornington Road. See the course map. For safety, roads will be closed in the neighborhood and police officers will be on site at various points. Each grade and girls/boys have a separate start. There is a water station in the middle and at the end. Kindergarteners may have one parent run with them. There is no fee for the parent unless they want to receive a t-shirt. The first 5 finishers for each grade for boys and girls will receive an award. At the finish line, the top finishers will receive a color-coded popsicle stick indicating their place and need to provide their name to the recorder at the finish line. 8AM: Race starts! So….don’t BEE late! Restrooms are available in the school. After the race, there is an awards ceremony at the teacher parking lot for the 1st five finishers for each grade for girls and boys. Walk-up registrations are welcome on race day for $20, but will NOT be guaranteed a t-shirt. Per tradition, 4th and 5th graders can submit an entry for the race t-shirt design contest. 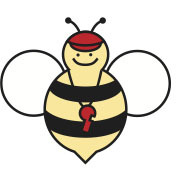 Designs for the theme – IB Runnin’ – must be submitted by Wednesday, March 13, 2019 to the Fun Run slot of the Bee Box in the Main Campus lobby. Download an entry form HERE. Fun Runs are a lot more fun when you have trained for a race. Therefore, it is not a one day event! Students will have the opportunity to run during recess. But, they need the opportunity to train at home as well. Help your child set training goals!. For more info, check out these websites with training tips, plans, and goals for kids: HERE and HERE.